Duplin County’s top three employers are agribusiness companies. These pork, poultry, and turkey processors are looking to hire more than 400 additional truck drivers to move their product to market. 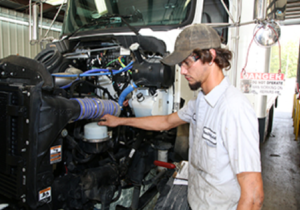 There is also a demand for qualified diesel technicians to service and repair their fleet of trucks. Two Golden LEAF grants totaling $1.7 million have helped James Sprunt Community College (JSCC) support these local employers by creating diesel mechanic and truck driver training programs. The programs are designed to fill industry-identified needs and train individuals with the skills needed to qualify for jobs paying at or above county wages. Students in the JSCC Diesel Mechanics program get practical, hands-on experience working on diesel trucks. 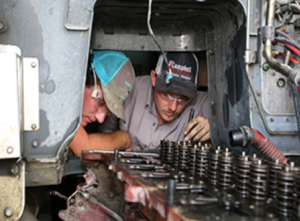 JSCC worked with more than 20 companies to design the diesel mechanic curriculum so that it equipped interested individuals with the skills needed for employment. Bob Slaughter, Director of Fleet Maintenance at Smithfield Hog Production, was instrumental in forming the plan for the college’s Diesel Mechanic program, said Myers. Not only did the region need a highly skilled workforce, some employees also needed retraining because the field of diesel mechanics is changing rapidly with new technologies, said Slaughter. JSCC opened the Diesel Mechanic program this fall enrolling 15 students in its first class where students will be pursuing a diploma in Diesel and Heavy Equipment Technology. The program will be expanded to offer an associate degree in Applied Science in Diesel and Heavy Equipment Technology starting in the fall of 2018. 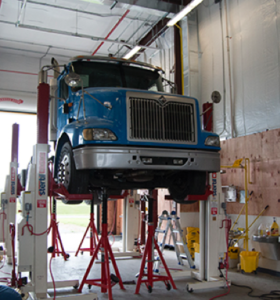 The Diesel Mechanic program also provides existing mechanics continuing education certificates in electrical, hydraulics, preventative maintenance, heating and air condition and brakes and alignment. Matthew Hardison work nights at Smithfield Hog Production in the preventative maintenance department while going to JSCC during the day to get his diesel mechanic degree. The Diesel Mechanic program also partners with local high schools in Duplin, Lenoir, and Greene counties through the Diesel Tech Academies. Local industry is excited about what the future holds. In talking with industry leaders about the skills gap for their mechanics, Myer said he learned that the region also suffered from a severe shortage of truck drivers. The new truck driver training program at JSCC is set to begin in fall 2017. The college will train more than 100 students to obtain a commercial driver’s license in the first two years and expects to place 70 percent of its licensed drivers in jobs. The truck driver training and diesel mechanic programs will be located at the college’s WestPark site adjacent to the diesel mechanic facility. Local companies are working directly with the JSCC Diesel Mechanic program to provide trucks, internships, and other expertise in the field as needed.